Bruno Silva is currently a staff researcher in the Nanomedicine group at INL. Dr. Silva focuses his research in the areas of Soft Matter and Gene and Drug Delivery. In particular, a major effort is devoted to the development of novel microfluidic-based methods to tailor with high accuracy the structure-function of soft self-assembled nanoparticles for gene and drug delivery and improve their efficacy in therapeutic applications. 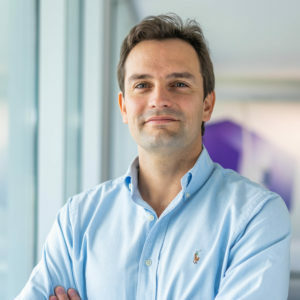 Bruno Silva holds a PhD (2009) in Chemistry from the University of Porto, Portugal, where he worked in the topics of Physical Chemistry, Soft Matter and Colloidal Science. He focused on the phase behavior and nanostructure of self-assembled surfactant systems, using small-angle neutron scattering (SANS) as the main characterization tool. As a Marie Curie postdoctoral fellow at the University of California Santa Barbara, USA, and Lund University, Sweden, he worked on the structural control of cationic liposome-DNA nanoparticles (also known as CL-DNAs or lipoplexes) and on the development of microfluidic devices with in-situ small-angle x-ray scattering (SAXS) for studies of soft matter under flow and out-of-equilibrium conditions. Bruno F.B. Silva, Carlos Rodríguez-Abreu and Neus Vilanova. Recent advances in multiple emulsions and their application as templates. Curr. Opin. Colloid Interface Sci. 25, 2016, 98-108. Nematic director reorientation at solid and liquid interfaces under flow: SAXS studies in a microfluidic device. Bruno F.B. Silva, Ramsey N. Majzoub, Chia-Ling Chan, Youli Li, Ulf Olsson and Cyrus R. Safinya. PEGylated Cationic Liposome – DNA Complexation in Brine is Pathway-Dependent. Biochim. Biophys. Acta – Biomembranes. 1838, 2014, 398-412. Size, shape, and charge of salt-free catanionic microemulsion droplets: a small-angle neutron scattering and modeling study. Unusual vesicle-micelle transitions in a salt-free catanionic surfactant: temperature and concentration effects.